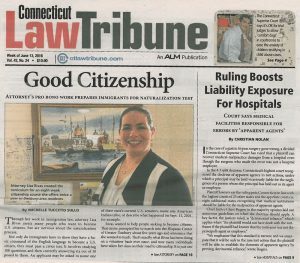 The Connecticut Law Tribune featured a front-page story on Cramer & Anderson Attorney Lisa Rivas in its edition for the week of June 13, highlighting her pro bono work helping immigrants in Greater Danbury become U.S. citizens. Attorney Rivas, who works in the firm’s Danbury office, was honored by the Hispanic Center of Greater Danbury at this year’s annual Citizens Recognition Breakfast, held June 2. She received the Above and Beyond Award for her volunteer work teaching a citizenship course. 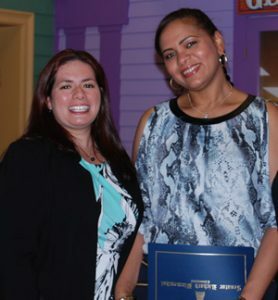 Attorney Lisa Rivas, left, with new U.S. citizen Juana Fernandez at the Hispanic Center of Greater Danbury’s Citizens Recognition Breakfast June 2. Attorney Rivas may be reached by phone in the Danbury office at 203-744-1234, or by email at lrivas@crameranderson.com. 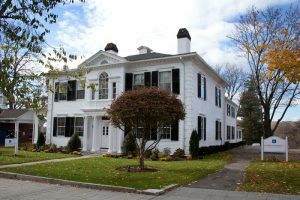 For more information on the firm, see the Cramer & Anderson website or call the New Milford office at 860-355-2631.